Snes9x is a Super-Nintendo emulator. This is one of the best programs to play emulated SNES games on a Windows-driven PC. 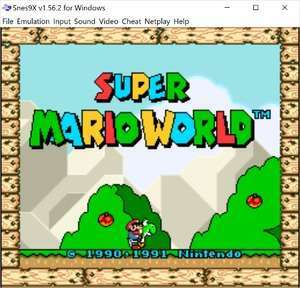 Snes9x is a portable, freeware Super Nintendo Entertainment System (SNES) emulator. It basically allows you to play most games designed for the SNES and Super Famicom Nintendo game systems on your PC or Workstation; which currently includes some real gems that were only ever released in Japan. Version 1.59.2 is a freeware program which does not have restrictions and it's free so it doesn't cost anything. For security reasons, you should also check out the Snes9X download at LO4D.com which includes virus and malware tests. Additional screenshots of this application download may be available, too.